Gin and Tonic is one of the most classic drinks of all time. A blend of earthy botanicals, crisp tonic water and the tart bite of lime make a gin and tonic a favorite in nightclubs everywhere. When you have balanced perfection, like a well-crafted gin and tonic, the bigger the drink, the better. However, if you cozied up to the bar at the Apex Social Club and asked the mixologist for a gin and tonic last November, you may have gotten more than you bargained for. On November 5, 2018, the world’s largest ever gin and tonic was poured on the sky-high rooftop patio of the Apex Social Club. We don’t know a gin aficionado anywhere that doesn’t love the idea of a larger than life gin and tonic. This record-breaking cocktail came in at just under 250 gallons – enough to give you, and hundreds of your friends, the hangover of a lifetime. The mega-sized cocktail required nearly 400 bottles of Empress 1908 gin, 165 gallons of tonic water and more than 5 gallons of lime juice. 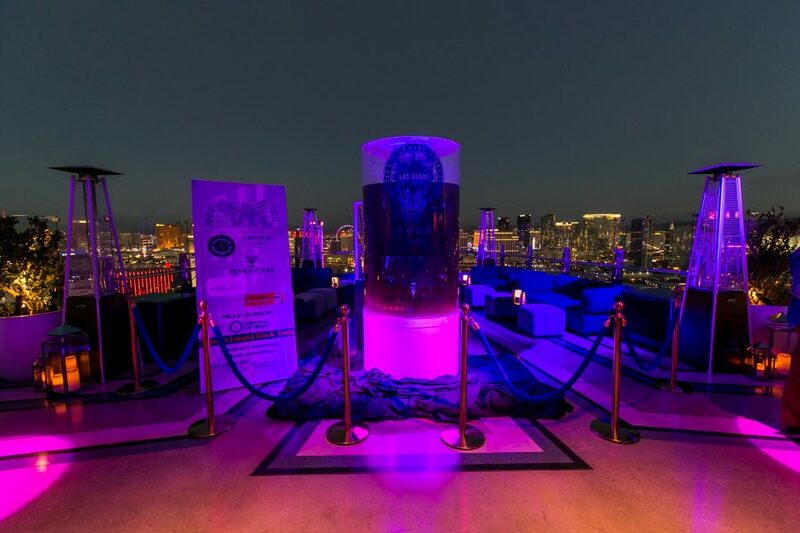 Guests of the event, which was organized by the United States Bartender’s Guild, took their turns at displaying a little flair as they poured a bottle of the indigo hued gin into the giant-sized cocktail glass. Once the creation was complete, it was garnished with giant ice sculpture in the shape of a lime wedge. We know the question that’s on your mind. Yes, guests were able to enjoy their record-breaking creation thanks to a special spout at the bottom of the glass. Still, the record-breaking cocktail was more than partygoers that night could handle, so patrons of the casino got to share in on the action. This record-breaking event, hosted at the Apex Social Club, wasn’t just an attention getting publicity stunt. The proceeds of the event went to a noteworthy, charitable cause. At Apex Social Club, you never need an excuse to indulge in a boozy concoction. This is the place where guests come to lose their inhibitions and soak up the ambiance of one of the hottest Las Vegas nightclubs. Still, throw in a good cause and tomorrow’s hangover suddenly seems like a minor sacrifice in the name of charity. Guests who attended the record making event paid $50 to pour a bottle of Empress 1908 gin into the towering cocktail, with proceeds going to the Month of Memory Campaign for Keep Memory Alive – a non-profit organization dedicated to research, treatment and care of patients and their families who are living with Alzheimer’s disease and other neurocognitive disorders. When it was all said and done, the world record breaking gin and tonic event raised $10,000 for the Keep Memory Alive organization. This record-breaking gin and tonic was crafted on the rooftop patio of the Apex Social Club, inside the Palms Casino Resort – with a backdrop of the city’s skyline that is hands down one of the best views in Las Vegas. With such an amazing backdrop, the Apex Social Club wasn’t about to let the scenery be tarnished with any old gin and tonic. The 250-gallon gin and tonic lover’s dream was created using Empress 1908 gin, which is known for its electric indigo hue. Empress 1908 gin is an infusion of botanicals inspired by the world-famous Fairmount Empress Hotel, which overlooks the Inner Harbour in Victoria, British Columbia. A teetotaler isn’t exactly the first thing that comes to mind when you think about a supersized gin and tonic, but it’s the hotel’s tea service that inspired the unique botanical blend of Empress 1908 gin. With a backdrop of one of the hotel’s classic, sumptuous teas, the creators of Empress 1908 gin added in 8 natural botanicals, including pea blossom – the botanical that’s responsible for the gin’s unforgettable indigo hue. The Apex Social Club is the Palms nightclub that’s going to introduce you to a Vegas you’ve never seen before. Located on the 55thfloor of the Palms Casino resort, the Apex Social Club is the place to be when you want to experience life at the limits. The outdoor patio of the Apex Social Club offers a 360°view of the Las Vegas skyline, along with a relaxed but contemporary atmosphere where you can choose to either kick back and enjoy a relaxed vibe or heat things up a little on the dance floor with some Vegas’s top DJ talent. It might be a little late to get a sip of the record setting gin and tonic, but no worries. Expert mixologists are on hand to recreate the magic or craft something completely unique just for you. Guests can also reserve the luxury, VIP bottle service and enjoy a more intimate experience of creating and sharing cocktails – including an Empress 1908 gin and tonic – tableside with their friends. Experience nightlife like you’ve never seen before and add the Apex Social Club to your list of “must see” things to do in Las Vegas and sip on a gin and tonic (or several) while you’re here.